We finally had some sun (for one day only) and believe me when I say spring has not arrived. It was quite cold and this is what I wore. I felt duped! Luckily I had the boy to keep me warm, nothing like a pair of big cuddly arms. This week I have spent most of the time ill with the flu, plus I had a nasty fall down some icy stairs and have badly bruised my leg which has meant that I've not been able to post. Hope you have all had a much better week! P.S. You may or may not have already heard that Google reader will be closing soon. For those of you who already follow me, you can still keep up to date with my fashion shenanigans by following through Bloglovin here. ahh im sorry about your week....if it makes you feel any better you look fantastic!! this outfit is perfection for sooo many reasons, the pants, the jewels, the coat....just love it! Bella bella!! 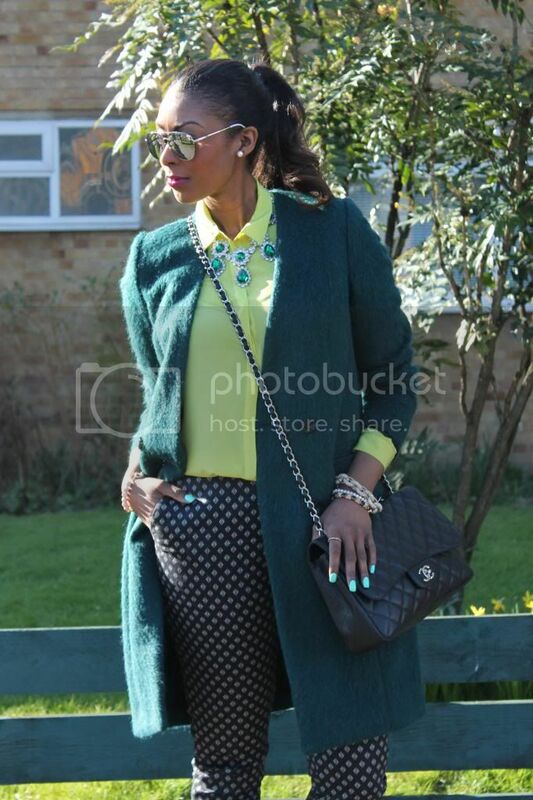 I love this colour colour combo between the coat and shirt with the necklace! 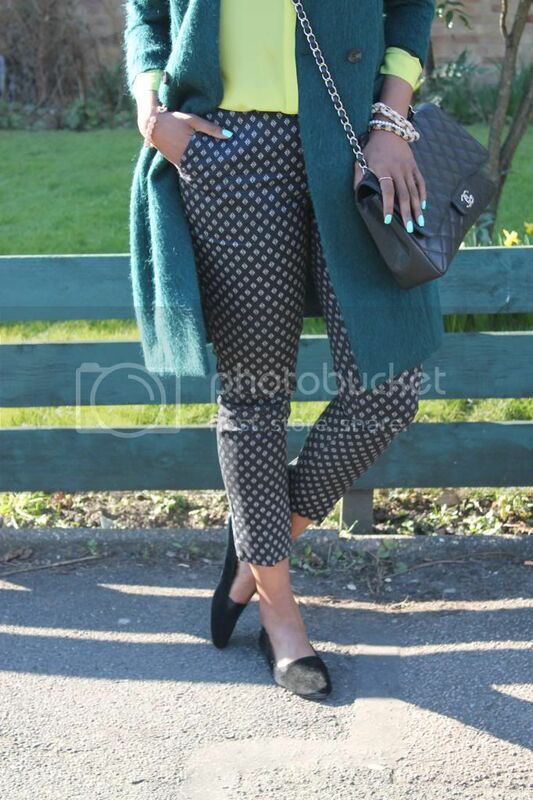 This is such a chic look babe! I love the mix of colors and textures and the accessories compliment everything so well. You look gorgeous! oh I love that coat from HM!! In fact I regret so much not buying it! You look fab, as usual!! Me too, I had a lucky shopping day after Christmas and happened to pop into H&M when it went on sale, such a good colour! Ohh this is my first time on your blog and I love it! 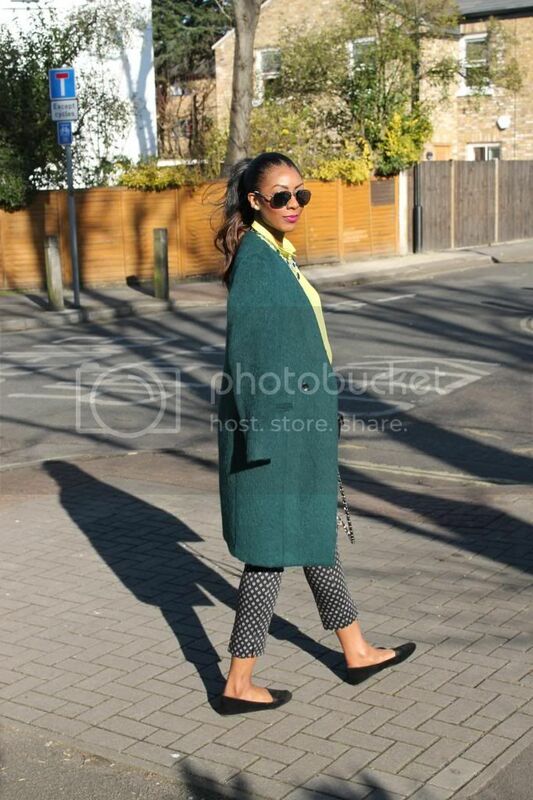 The green suits you very well, Im especially glad I've found another tallie in London! off to read the rest of your posts! Absolutely LOVE this and your blog! Love love the neon and green combo!